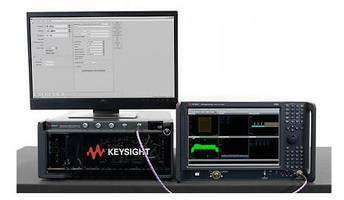 mmWave Testbed from Keysight Technologies eliminates the need for OTA testing and spatial beam measurements. mmWave testbed is a 26 GHz 5G NR active array testbed that offers more than a simple RF parametric performance. It includes sidelobe levels, dynamic beam characteristics, and spatial variations of EVM and ACPR. Keysight solutions are scalable across research, development, and manufacturing. Multi-format testing in a single PXI chassis makes for space-efficiency and flexible design validation. Seamless combination of mmWave hardware and software accelerates transition into production with minimum cost. The use of phased arrays at mmWave frequencies requires over-the-air (OTA) testing as well as spatial beam measurements. Keysight metrology-grade test equipment offers the sensitivity that base station designers need to overcome these challenges and to go beyond simple RF parametric performance. New spatial measurement requirements include sidelobe levels, dynamic beam characteristics, and spatial variations of EVM and ACPR. As the first mmWave testbed with 5G-ready source and analyser inside a PXI chassis, the Keysight solution is scalable across the product lifecycle, from research and development through manufacturing, using modular hardware and software. The 5G NR-ready testbed enables multi-format testing in a single chassis for space-efficient and flexible design validation, even at mmWave. “Keysight has enabled us to validate the breakthrough data throughput performance of our Ball-built arrays at 26 GHz and gain visibility into our performance edges, using standard-compliant 5G NR waveforms and processing” stated Bob Donahue, chief executive officer, Anokiwave. Visit Keysight at Mobile World Congress 2018, stand 6G30, Hall 6, to see a demonstration of the 5G Testbed for Design Validation making over-the-air (OTA) measurements of the new Ball Aerospace phased array antennas for 26 GHz and 28 GHz. Ball Aerospace pioneers discoveries that enable our customers to perform beyond expectation and protect what matters most. We create innovative space solutions, enable more accurate weather forecasts, drive insightful observations of our planet, deliver actionable data and intelligence, and ensure those who defend our freedom go forward bravely and return home safely. For more information, visit www.ball.com/aerospace. Anokiwave is a cutting edge provider of highly integrated IC solutions that enable emerging mm-Wave markets and Active Antenna based solutions. Anokiwave’s creative system architectures and optimal selection of semiconductor technologies solve the toughest engineering problems. Anokiwave is based in San Diego, CA and operates design centers in Phoenix, AZ and Boston, MA. Additional information can be found at http://www.anokiwave.com. The development of 5G depends on up-to-date tools that let designers easily explore new signals, scenarios and topologies. Keysight’s 5G solutions are ready to enable deeper insights as development evolves with the standard. In design and test, Keysight is helping industry leaders innovate across new and existing technologies as they transform ideas into reality. Additional information about Keysight's 5G design, test and measurement solutions is available at www.keysight.com/find/5G.